The cost of housing is a key driver of poverty in the capital. 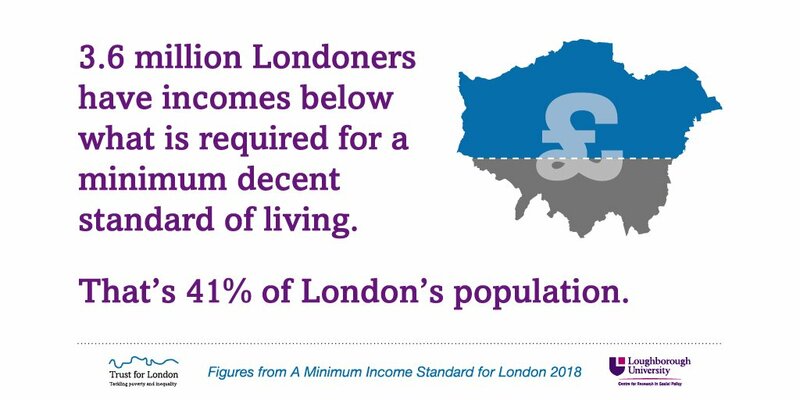 Many Londoners do not have access to genuinely affordable housing, which is also good quality and secure. Creating such homes is essential. We also need places which create a sense of community, where people can feel safe and can participate. The wider environment is also vital, from the air we breathe to the open and green spaces Londoners have access to. Making housing more affordable. This includes: new and existing housing; reducing the cost of housing; and tackling secondary costs such as letting agency fees and tenancy deposits. Improving the quality of housing and security of tenure, particularly in the private rented sector, including better regulation and reducing evictions. Improving the provision of temporary accommodation. Increasing tenants’ collective voice and influence over their homes, and their neighbourhoods, especially the built environment, green spaces and transport. Improving understanding of public attitudes on renting and affordable housing. Engaging people on low incomes in planning and regeneration, including of housing estates and neighbourhoods. Improving the quality of neighbourhoods people live in, particularly the built environment and green spaces, as well as air quality. Legal casework and representation in areas of law that fall outside of legal aid, particularly in relation to the private rented sector. We will only fund organisations who are already undertaking legal casework and preferably hold the AQS at this level or equivalent. We will also fund strategic legal work to challenge unlawful policy and practice in housing. Working on housing-related issues. This means we will fund second-tier organisations to support other groups to improve their practice, share knowledge and influence. Please read the funding guidelines in full before filling in our funding application form. If, after reading the guidelines, you are in doubt as to whether your work fits then please telephone us so that we can discuss and answer any specific queries you may have, on 020 7606 6145. Find out if your work is eligible by downloading our funding guidelines. 4 Jun 2019, 1 p.m.